Bringing Latin flavour to Scottish dance floors is Glasgow Tango Studio. Launched in 2005, by tutors Jeff Allan and Sari Lievonen, the hub operates across different venues and class levels. Tango is a partner dance from the Argentinean region, with many modern-day forms. Milonga sessions are set to a tanda of similar songs, before a cortina (break) allows for the swapping of partners. In Glasgow Tango Studio events, dancers swap partners by inclining their head towards a prospectus partner – who will move forward (to accept) or look away to decline. This tradition is called cabeceo. After dancers have practiced their moves milongas often conclude with students demonstrating their skills. This improvised showcase is however different from the choreography of performance tango. The spacing of these sentences varies depending on the type of tango. Milonguero tango uses close embraces and small steps, whereas salon tango favors open posture and longer steps. Core to both styles is traveling – heal first – with the music and your partner. Tango connection describes the way in which a dancer can anticipate their partner’s next move. To experience this magic dancers can join Glasgow Tango Studio, on 21 April at El Abrazo Milonga (in Glasgow CCA). The night promises music from golden era tangoes, milonga and tango-valses, as well as contemporary arrangements of traditional tunes. 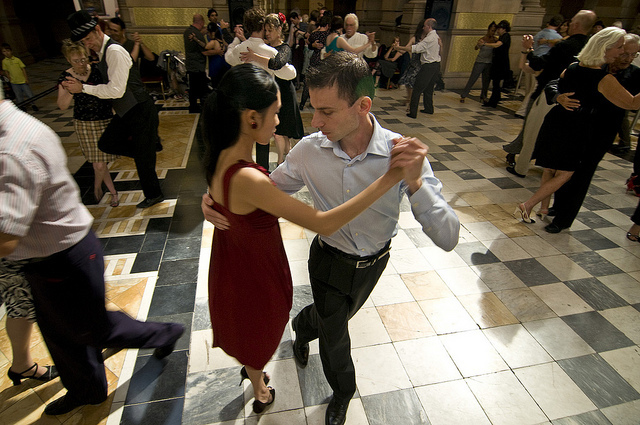 Alternatively, beginners can try the dance at Glasgow Tango Studio taster sessions, the next of which is being held on 5 May, also at Glasgow CCA. These sessions occur around three times a year. Glasgow Tango Studio classes are currently being held in 76 Kelbourne Street Scout Hall, but updates of their details are held online. Class participants are encouraged to book in advance, via the website or phone, to ensure even numbers for dance couples. Lievonen also explained that while tango is open to all ages, she finds it best suited to adults.